What started as a relaxed gathering of people with a shared interest turned into an adrenaline-filled competition of one hundred seventy six finalists showcasing their Sudoku skills in front of a crowd of supporters, shoppers and spectators during the 7th Philippine Sudoku Super Challenge (PSSC) held on Sunday, January 27, 2013 at the SM City North EDSA, The Annex, in Quezon City. After the five rounds narrowing the field, top five puzzlers of the Sudoku Wizard category competed in the championship round, each solving the overlapped Sudoku in 30 minutes. As onlookers watched the 5 finalists made every number fall on the right grid of the puzzle, the crowd was surprised as two Sudoku wizards called the contest over when they finished almost the same time before the time ended. Besting 106 puzzlers in the wizard category were Candice Renee Beatrice T. Solidarios of University of the Philippines Rural High School who won the champion trophy plus cash prize of Php50,000.00 and some gift items; Natalia Beatrice Q. Dy of St. John’s Institute, Bacolod City was proclaimed 1st runner-up, winning Php30,000.00 plus trophy and gift items; and Mikel Paul Tan Ayroso of Grace Christian College, 2nd runner-up, winning Php20,000.00 plus trophy and gift items. Making it on the 4th place was Romeo M. Esguerra of Colegio San Agustin-Biñan and Bryan Russel Esperanza of Saint Louis University-Laboratory High School. Indeed, it was a reversal of fate for both Solidarios and Dy who were last year’s 1st runner-up and champion respectively in the whiz kid category. Using her speed and accuracy in almost all rounds, Kaye Janelle F. Yao of Grace Christian College, last year’s 2nd runner-up finally made it to the top of the 36 participants in the grandmaster category. She won Php60,000.00 plus trophy and several gift items. Alvin Ian Chan of Ateneo De Manila, 1st runner-up for two years in a row now went home with Php40,000.00 plus trophy and gift items. Ralph Joshua P. Sarrosa of the University of the Philippines-Visayas, finished as 2nd runner-up, taking Php20,000.00 plus trophy and gift items. Cheyenne Hsieh of De La Salle University-Manila and Ethan Riley C. Chan of Zamboanga Chong Hua High School ended as 3rd runner-up and 4th runner-up respectively. As for the whiz kid category, Sanielle Meliz H. Ong of St. John’s Institute, Bacolod City swept the competition away by winning the championship round, winning Php20,000.00 plus trophy and gift items. Vicente Raphael C. Chan of Zamboanga Chong Hua High School bagged the 1st runner-up trophy with Php.10,000.00 and some gift items. Jan Vincent A. Simbol of BHC Educational Institution, Inc. made it as 2nd runner-up with Php5000.00 cash prize and gift items. Albriz Moore C. Bagsic of Lilyrose School and Crilex Comicho of Bonifacio Elementary School were the proud 3rd and 4th runners-up respectively. The 7th PSSC had been made more special by the presence of the guest speaker, Mr. George Barcelon, president of Integrated Computer Systems, Inc. who not only inspired the winning spirits of Filipino Sudoku enthusiasts but also extended his generosity to the MTG Philippines. The biggest contributing factors for the success of the 7th PSSC were these sponsors: SM Supermalls, Phoenix Publishing House, Inc., SHARP Calculators, Vital 1 Purified Mineral Water, Pilot Ballpens, Cosmos Trading. MTG is so much indebted to Ms.Millie F. Dizon, Vice President for Marketing Communications, SM Supermalls, Mr. Lucero Ong, Vice President of Collins Trading International, the jurors headed by Prof. Ma. Luisa Villano, Admissions Officer, Miriam College and Dr. Jaime Caro, Assistant Vice President for Development and Director of UPIT Training Center Program. This entry was posted in News article on January 30, 2013 by admin. 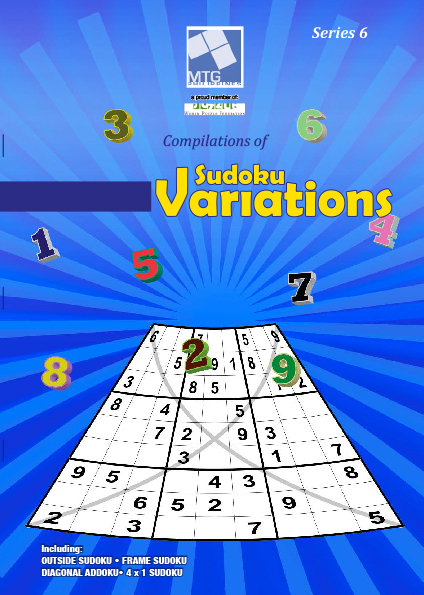 National Finalists of the 7th Philippine Sudoku Super Challenge may contact their center coordinators to order or buy a copy. This entry was posted in Announcements, News article on January 19, 2013 by admin. This entry was posted in Announcements, News article on January 18, 2013 by admin. Please be informed that the national finals of the 7th Philippine Sudoku Super Challenge (PSSC) will be on Sunday, January 27, 2013 at SM City North EDSA, the Annex, in Quezon City. Registration time starts at 8:30AM. Since SM North EDSA opens for business at 10 AM, and the registration starts at 8:30AM, you may use the Garden Entrance to reach the Citystyle 4F. The RDU Entrance leading to the car park may also be used. Please bring your school/company ID for easy identification and admission. The opening program starts at 10AM and the competition follows immediately. All official finalists from selected provinces who have been notified can avail of the free dormitory accommodation courtesy of our major sponsor, the Phoenix Publishing House, Inc. Coaches and companions are not included in this package. However, coaches and accompanying persons who wish to stay with their participants may send an intention at this email address, mtg.mco@gmail.com, for reservation. Likewise, always check your inbox for more details about the contest. This entry was posted in Announcements, News article on January 15, 2013 by admin. 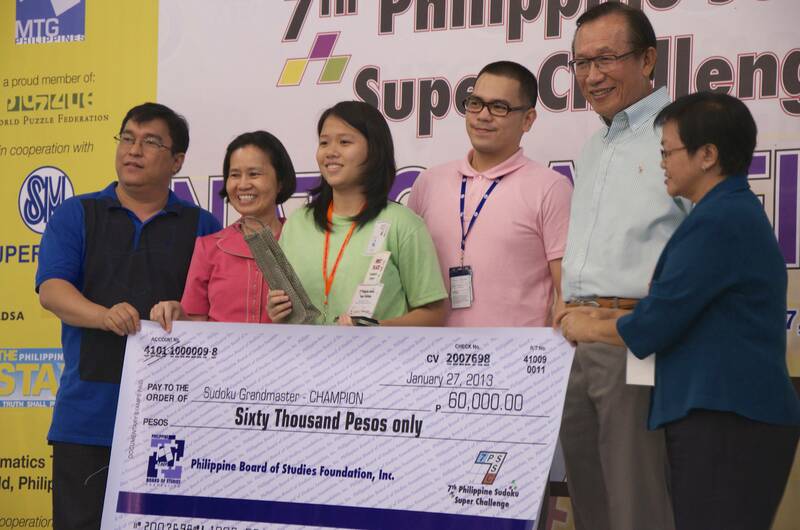 Only a little above a hundred participants have been given the green light to proceed to the final round of the 7th Philippine Sudoku Super Challenge (PSSC) which will be held at SM North EDSA in Quezon City on Sunday, January 27, 2013. From 4512 Sudoku puzzlers who joined in the regional elimination round conducted in various SM Malls in the country, just more than 200 made it as qualifiers for the national finals. However, to this date, barely 164 of them confirmed their participation. Among them are 36 college students and professionals, 99 high school students and 29 elementary pupils will vie for the following titles: Sudoku Grandmaster, Sudoku Wizard and Sudoku Whiz Kid, respectively. The competition will be tougher and more challenging with the presence of almost a dozen of last year’s PSSC winners. This entry was posted in News article on January 3, 2013 by admin.